The Pratt & Whitney F100 (company designation JTF22) is an afterburning turbofan engine manufactured by Pratt & Whitney that powers the F-15 Eagle and F-16 Fighting Falcon. This engine program was called the IEDP (Initial Engine Development Program). It was funded and managed out of the Aeronautical Systems Division (ASD) at Wright Patterson AFB. Under ASD, a Systems Project Office Cadre was assigned to manage both the FX Aircraft and Engine definition phase. The Turbine Engine Division of the Air Force Propulsion Laboratory was employed in a support role to assist ASD Systems Engineering in evaluations of technical risks. Later upon selection of the F-15 the ASD engineering cadre became the F-15 Systems Project Office. The IEDP was created to be a competitive engine design/demonstration phase followed with a down select to one winning engine design and development program. General Electric and Pratt Whitney were placed on contract for an approximately 18-month program with goals to improve thrust and reduce weight to achieve a thrust-to-weight ratio of 8. At the end of the IEDP, GE and PW submitted proposals for their engine candidates for the Aircraft that had been selected in the FX Competition. That Fighter was the McDonnell F-15 Fighter. The engine was designated the Pratt Whitney F-100 engine. The Air Force would award Pratt & Whitney a contract in 1970 to develop and produce F100-PW-100 (USAF) and F401-PW-400 (USN) engines. The Navy would cut back and later cancel its order, choosing to continue to use the Pratt & Whitney TF30 engine from the F-111 in its F-14. The F100-100 first flew in an F-15 Eagle in 1972 with a thrust of 23,930 lbf (106.4 kN). Due to the advanced nature of engine and aircraft, numerous problems were encountered in its early days of service including high wear, stalling and "hard" afterburner starts. These "hard" starts could be caused by failure of the afterburner to start or by extinguishing after start, in either case the large jets of jet fuel were lit by the engine exhaust resulting in high pressure waves causing the engine to stall. Early problems were solved in the F100-PW-220, and the engine is still in the USAF fleet to this day. The F-16 Fighting Falcon entered service with the F100-200, with only slight differences from the -100. Seeking a way to drive unit costs down, the USAF implemented the Alternative Fighter Engine (AFE) program in 1984, under which the engine contract would be awarded through competition. The F-16C/D Block 30/32s were the first to be built with the common engine bay, able to accept the existing engine or the General Electric F110. Due to the unsatisfactory reliability, maintenance costs, and service life of the F100-PW-100/200, Pratt & Whitney was eventually pressured into upgrading the engine to address these issues. The resulting engine, designated F100-PW-220, almost eliminates stall-stagnations and augmenter instability as well as doubling time between depot overhauls. Reliability and maintenance costs were also drastically improved, and the engine incorporates a digital electronic engine control (DEEC). The F100-PW-220 was introduced in 1986 and could be installed on either an F-15 or F-16. A non-afterburning variant, the F100-PW-220U powers the Northrop Grumman X-47B UCAV. The "E" abbreviation from 220E is for equivalent. The abbreviation is given to engines which have been upgraded from series 100 or 200 to 220, thus becoming equivalent to 220 specifications. The first -229 was flown in 1989 and has a thrust of 17,800 lbf (79 kN) (dry thrust) and 29,160 lbf (129.7 kN) with afterburner. It currently powers late model F-16s and F-15Es. 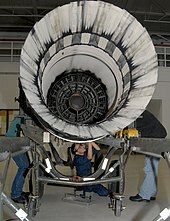 Using technology developed from the F119 and F135 engine programs for the F-22 Raptor and F-35 Lightning II, the current production F100-PW-229 EEP (Engine Enhancement Package) incorporates modern turbine materials, cooling management techniques, compressor aerodynamics, and electronic controls. Deliveries of the -229EEP began in 2009. ^ "Designations Of U.S. Military Aero Engines". www.designation-systems.net. Retrieved 17 April 2018. ^ a b ""The Development of the F100-PW-220 and F110-GE-100 Engines: A Case Study of Risk Assessment and Risk Management"" (PDF). dtic.mil. Retrieved 17 April 2018. ^ "F100-PW-229 Engine Enhancement Package brochure" (PDF). 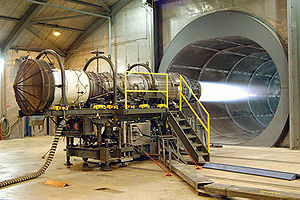 ^ "Pratt & Whitney F100-PW-220". National Museum of the United States Air Force. May 28, 2015. ^ Fighter Wing: A Guided Tour of an Air Force Combat Wing. Wikimedia Commons has media related to Pratt & Whitney F100. This page was last edited on 2 February 2019, at 18:53 (UTC).